Americans are getting bigger, and obesity rates are higher than ever. Corporations are looking to programs to get their employees moving, and are even getting insurance breaks for doing so. WellLife was a student project, where three fellow students and I were tasked to propose concepts for a health app and pedometer device, designed for a very wide audience. We chose the health score as an overall currency for measuring one's health, one that could be calculated by a range of devices, but primarily a pedometer measuring activity. The web app is designed in modules, so that it can be customized for each person depending on their needs or games in which they are participating, at any given time. The main concepts are organized by persona types; Danny, chronic disease patient, Trisha, becoming mother, and Roy, lazy professional. Because health is not confined to the doctor's office, but rather travels with you everywhere you go, it's important to have access to your health data at any time. 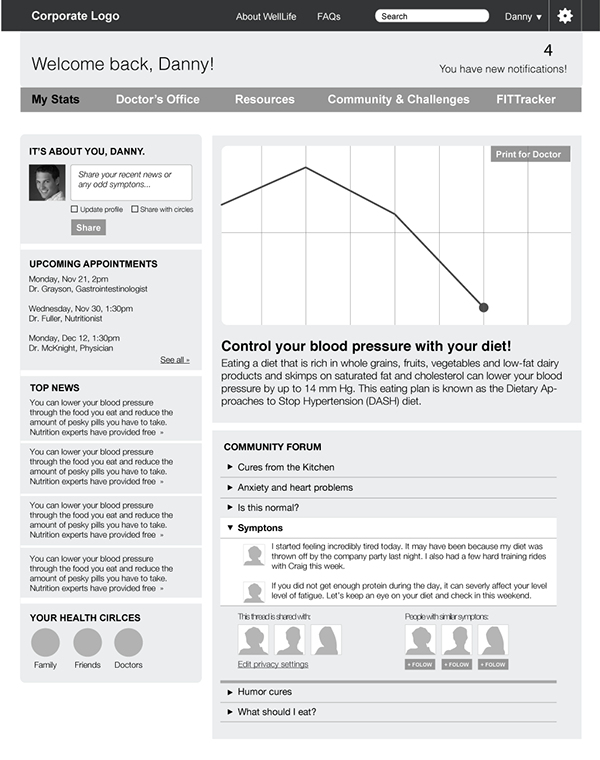 In the scenario above, the app is customized for an individual that consistently has high blood pressure. 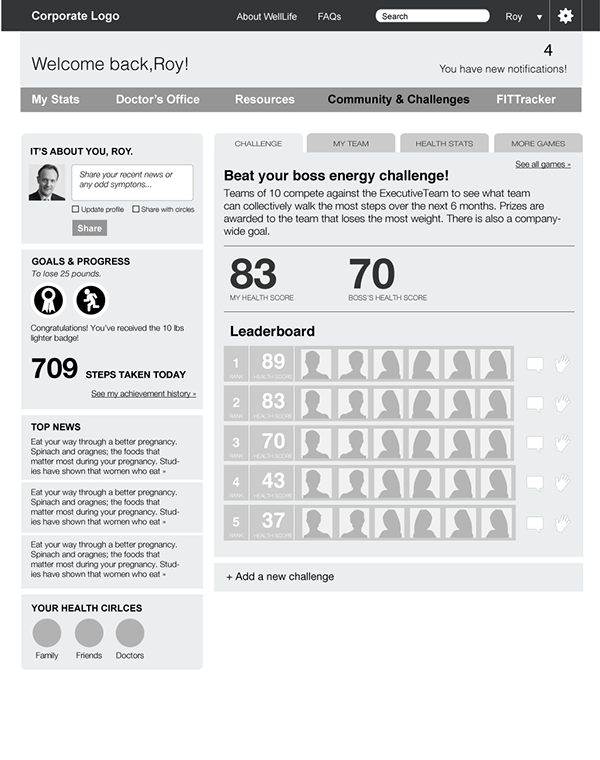 The app will visualize one's blood pressure that is tracked daily. This helps close the gap between reports from the doctor's office and daily life. When it's time for another doctor's visit, the patient is armed with data that communicates the full picture of his health. The app would also provide relevant tips for lowering one's blood pressure, and acknowledge the individual for achieving lower numbers. Now take, for example, a pregnant woman. From conception through birth, this found lady's needs are ever-changing. She's most likely trying to adopt new healthy habits for the baby like taking a prenatal pill, resisting the sweet food temptations, or increasing the amount of calcium she's consuming. By pairing up with a partner, she is much more likely to form and stick to a new healthy habit. The app would track her dedication to a new habit with a simple 'yes' or 'no' prompt that is reported to her partner. Positive reinforcement is exchanged digitally with a 'pat on the back' and through conversation in the office. Many barriers prevent people from being active; Namely, work, competing priorities, time, stress, lack of willpower, and laziness. Community games held within the workplace can help people overcome these barriers. A few things are important in these games: competition, rewards, and engagement. Competition is mainly created by people themselves. However, the app can facilitate the competitive spirit with a leader board that compares people closest in score, or at the same skill level. Rewards can be provided at the company level through vacation time or cash. They can also be as simple as an achievement badge or 'employee of the month' style acknowledgement. The important thing is that people are noticed, in some capacity, for doing good. Our approach to keep people engaged, is two-fold. 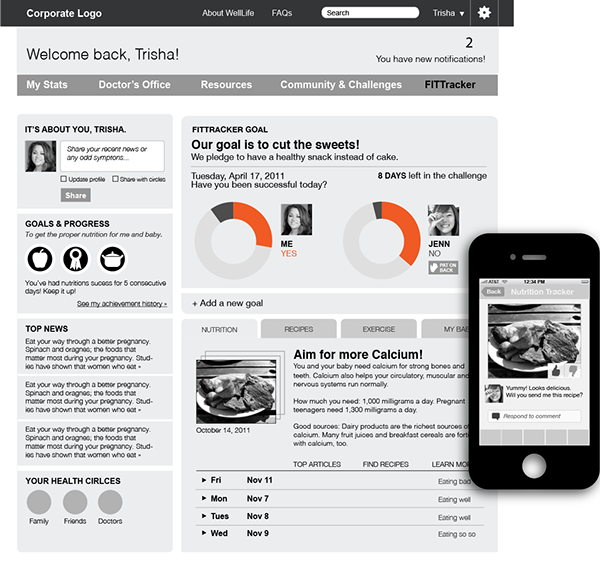 It's both to create compelling challenges, like 'Beat Your Boss Weight Loss', and to encourage partner activities. For example, taking a walk alone may give you 10 points, while taking it with a co-worker would give you 20 points. With games that are competitive, that give rewards, and that keep people engaged, a community of corporate workers can begin to overcome their barriers to exercise. This project was done in collaboration with Erin Moore, David Bellona and Benjamin Gadbaw as part of Karen McGrane's Design Management course at SVA IxD.